What do you do when you're out for a bar crawl on St. Patrick's Day? You make sure you get really amazing food in you so that you can act like a champion and go all day. What kind of food fits that bill? Why I'm glad you asked my friend. When you're in Wicker Park this means Big Star. 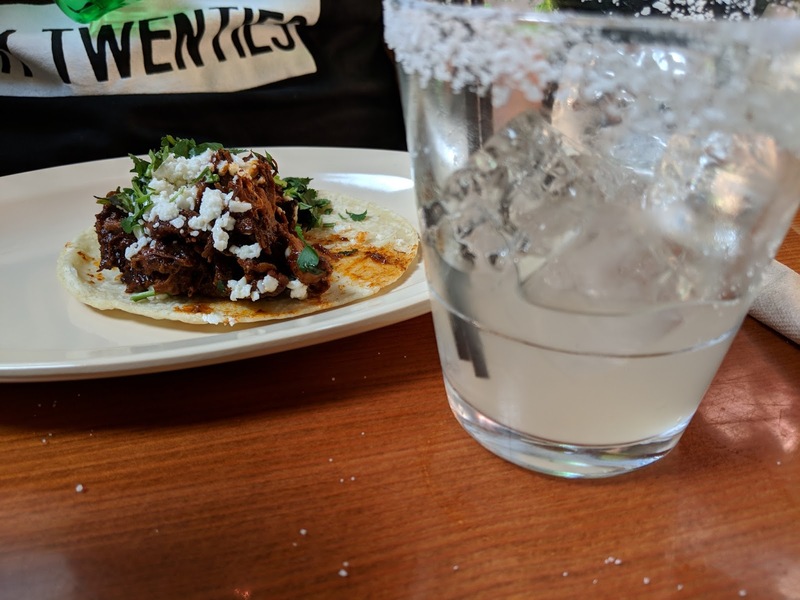 At lunch time we decided we needed to regain strength before powering through our afternoon and I knowing how amazing Big Star's tacos are highly recommended that we feast there. While everyone else enjoyed margaritas and Texas beers Kevin and I decided to go for a drinking break and re-hydrate with water. 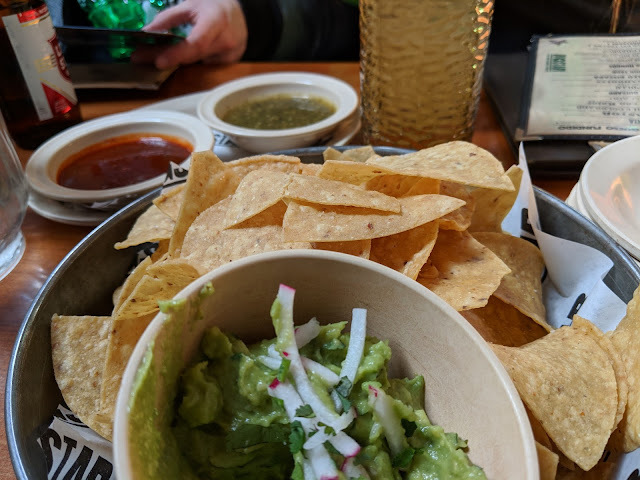 Chips, salsa and guacamole were ordered for the table. 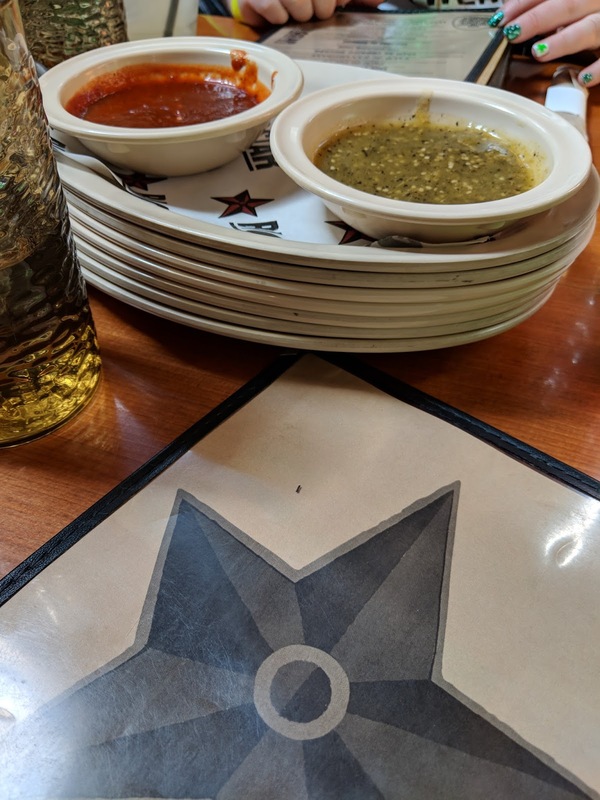 Chips and salsa is one way I judge a Mexican restaurant. Some places have super thick chips that are dry and cold. Good places like Big Star give you thinner chips that are warm and crisp. I enjoyed the chipotle salsa best. Everyone loved the guacamole and that was gone in almost a heart beat. 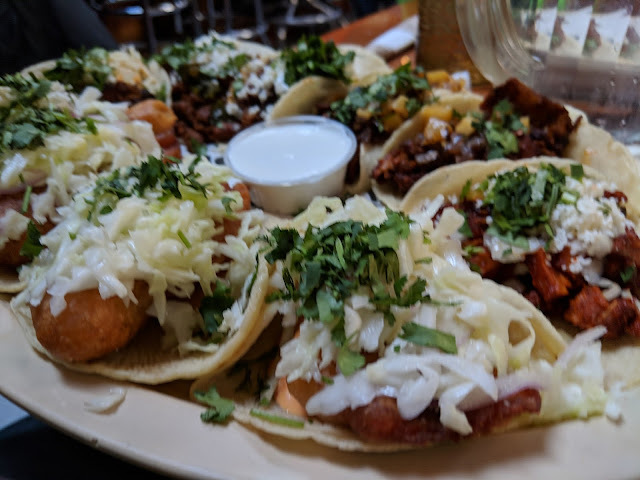 My favorite part about Big Star is that you're ordering tacos a la carte so you can pick as many different flavors as possible. For me who loves to try a little bit of everything this is perfect. I thought it would be nice to try a new flavor so I went with the Taco de Papas con Rajas which is a potato filled taco. Even though I had asked before ordering about the spice level, which I'm happy our waitress suggested some extra crema to go with it, it was spicier than expected. It was really good though. I would definitely get that one again. 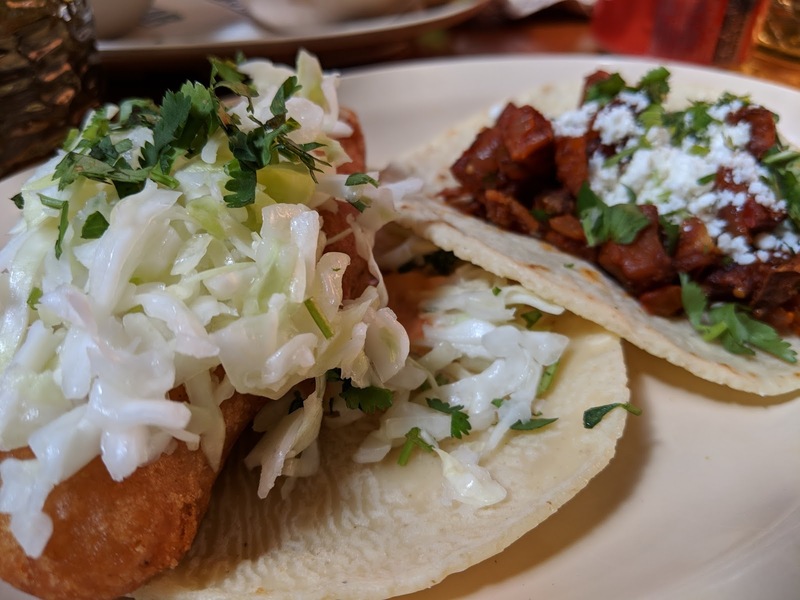 My second choice was my favorite the Taco de Pescado. It is the most perfectly beer battered fried piece of tilapia topped with chipotle mayo and lime. Every time I've had this taco they have literally been perfect. Perfect fry on the fish along with the perfect ratio of fish to tortilla to toppings. Each bite was deliciously perfect. Between everyone in our group we got a decent amount of the taco menu. I got the opportunity to try a little bit of the Taco de Pollo meat. It was so moist and flavorful. I'm sure the rest of the topping on the taco just complimented it perfectly. Definitely going to get an entire one for myself next time. Didn't get to try any of the other flavors that were picked since they were gobbled up so quickly. 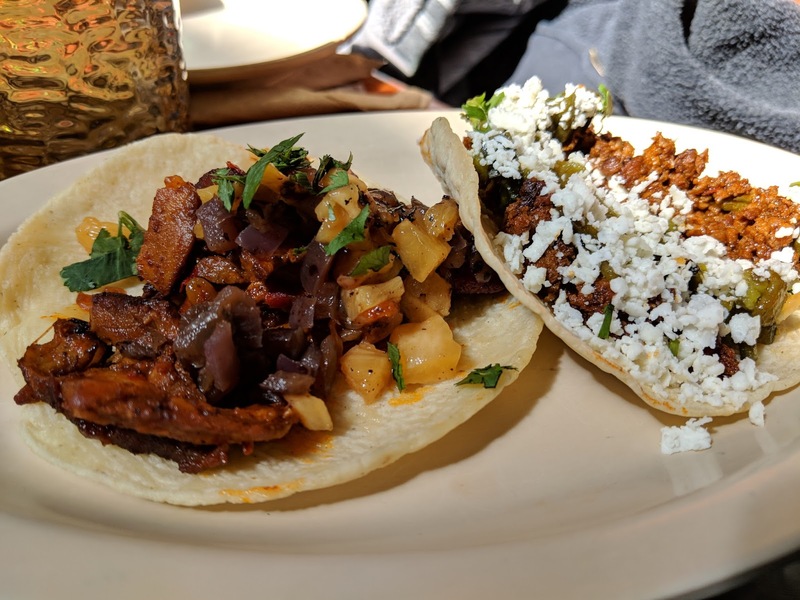 I have enjoyed the Taco al Pastor on a previous visit. The belly was so flavorful that even though I didn't get the pineapple on it I didn't think it needed it. 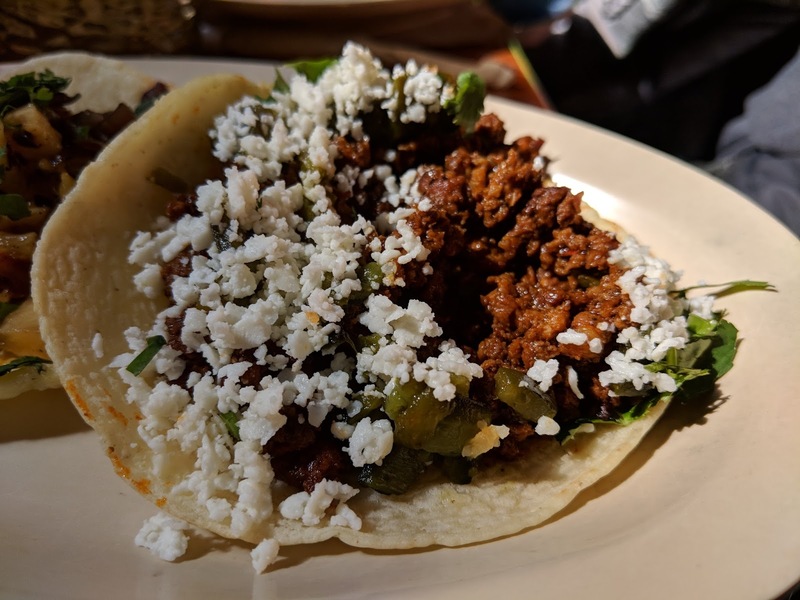 When you're in need of delicious Chicago tacos Big Star is the way to go. I'm still salivating over that perfect fish taco!